The government failed so he took it on his own to provide fire protection. From that humble start sprang what is today a modern countywide fire service. 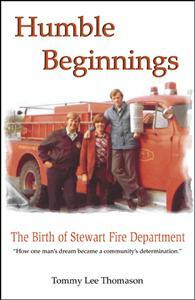 Humble Beginnings is the true story of one man’s dream to form a volunteer fire department that soon became a community’s determination. After the government failed to provide adequate fire protection for his rural community, Tommy Thomason set out on a mission to get it done on his own. The book chronicles the ups and downs he and the people he enlisted experienced in their struggles. Sometimes funny, sometimes tragic, the story is one of pride, hard work and eventual success. Dreams can come true. Humble Beginnings is one shining example that people working together can still create miracles.